Finding a jib crane that fits your exact needs can be difficult. That is why we put together what we consider to be the top jib cranes on the market. We looked at dozens of cranes and decided on these based on many factors including price, product reviews, construction material, usability, and many others. We hope you find this list useful in your search. has four mounting slots, for easy mounting. It also has a double pivot arm, for using in small spaces. 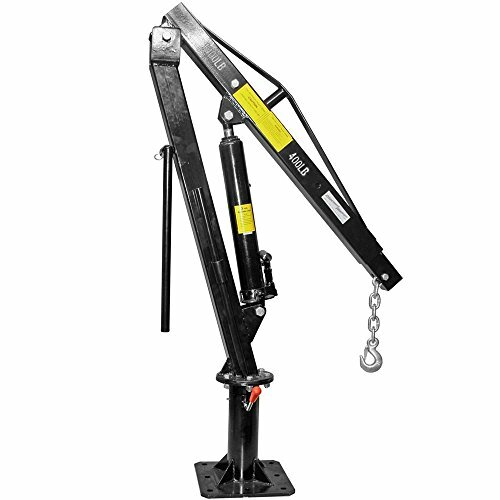 The overall height of this crane is 46-1/16 inches, the maximum arm span is 39-3/4”, and the height under the raised hook is 35-1/2”.The mounting plate is 8” x 8”, and the total weight of the crane is 95 pounds. 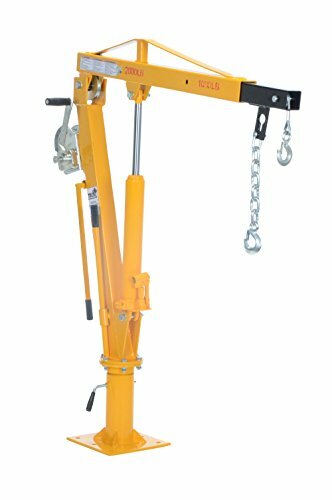 This crane can be had for under $1500, and would be very useful to people who do a lot of lifting in and out of vans and trucks, such as small shipping companies and vendors. 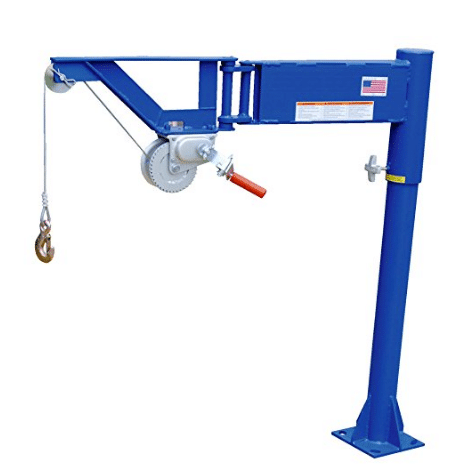 The 2nd best option in our roundup of jib cranes is the Pickup Truck Bed Jib Crane Lift Hoist. This pickup truck jib crane is made to be mounted in pickup trucks. It will not work with vans because it is too tall. It has a lifting capacity of one half ton, and is made of steel construction. The s-crane-1000 is sold by discount ramps. The total weight of the crane is 126 pounds. There are many features on this crane. For example, it has a swivel base with a 360 degree rotation. 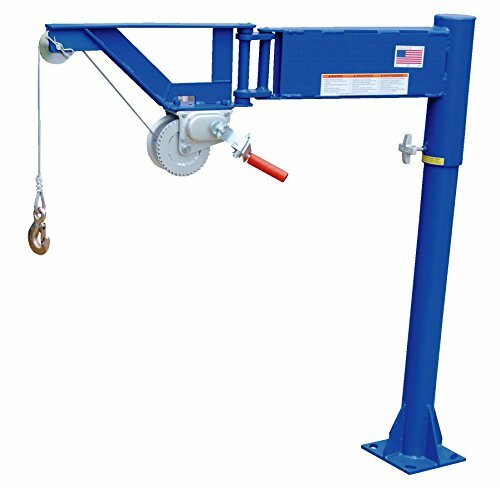 It is portable, and makes it simple for a single person to lift engines, boats, and other heavy objects. There is a base that is already drilled, making it easy to mount to that back of a pickup truck. The chain and hook are extremely strong. Product reviewers say that it is a good product that works well, although, the hydraulic cylinder is a little slow. This jib crane is one of the best values at just over $200. The third item in our review of jib cranes is the Vestil WTJ-4 Painted Steel Winch Truck Jib Crane. 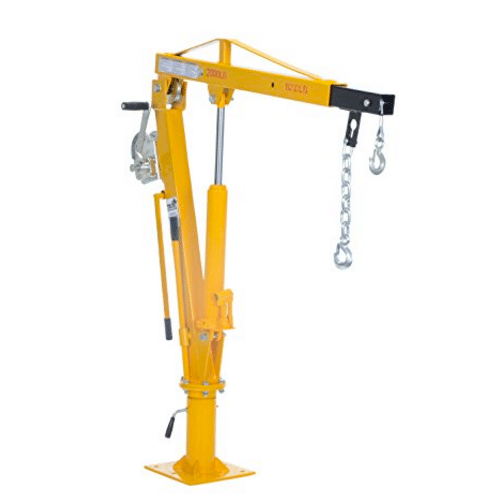 This crane by vestil comes loaded with features, and customers rate it well. It has a maximum lifting capacity of 1,000 pounds, weights 150 pounds, and is made of steel construction. It has a height of 56 inches, and a length of 10.6 inches. As noted above there are many features on this crane that most others do not have. 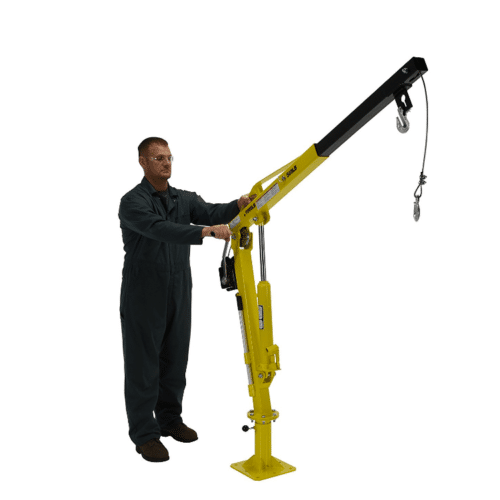 It has a telescoping boom that gives this crane a large variety of uses. There is a pre-drilled base for easy mounting. This crane has a 360 degree swivel like most jib cranes. Another amazing feature of this jib is the manual cable winch. The general consensus among those who have tested the vestil, is that it is easy to mount, although the assembly can be complicated, and some people even had parts missing from shipping. The Vestil is a great price for the quality of the crane. 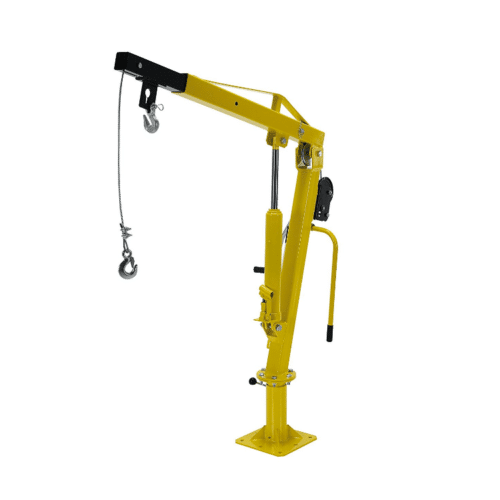 The apex hitch mount jib crane was made to help lifting heavy equipment in and out of pickup trucks. 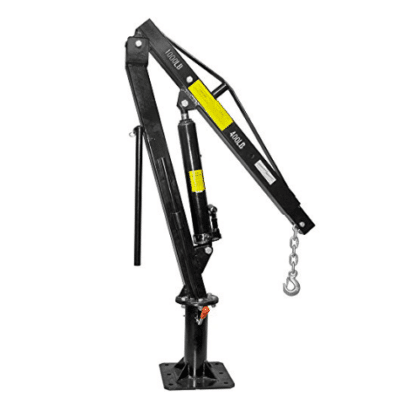 This crane works with 2 inch class 3 and 4 hitches. The crane has two legs of its own, and uses the hitch as the third. 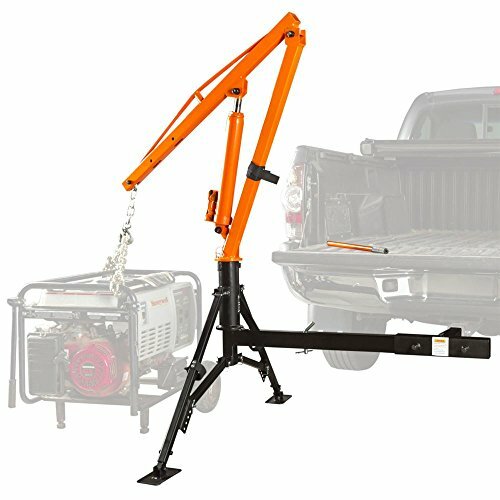 This crane makes it easy to lift generators, welders, or other heavy objects in and out of the back of a truck or trailer. The capacity of the apex is 1,000 pounds, making it capable of carrying even the heaviest of loads. It has a 360 degree swivel capability, and a 48 inch boom lift. 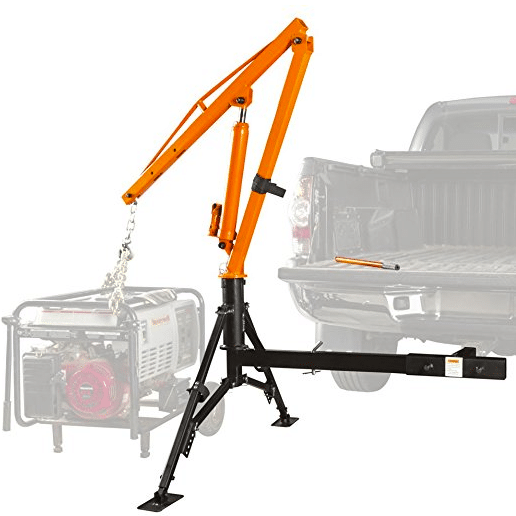 The support legs are adjustable, making this crane compatible with most truck/trailer configurations. This crane is also made out of steel. Although most customers were happy with their purchase, some were more critical and said it may not be of the best design and quality. One buyer even had a defect that kept it from being functional. Although, the company has great customer service and is willing to replace faulty/missing parts. The Apex is a steal, coming in at just over $300. The vestil WTJ-2 makes the last spot on the list, not being quite as good as brother, the WTJ-4. 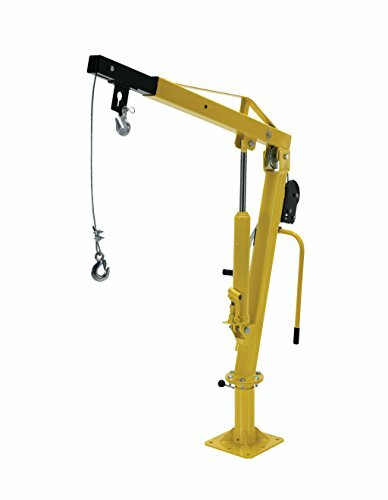 This jib crane is very versatile, being able to be mounted on the floor, wall, or in a van or truck. It has a capacity of 1,000 pounds when fully retracted, but watch out, as it is only capable of carrying half of that while the boom is fully extended. The vestil is 56 inches tall, weighs 125 pounds, has a length of 10.6 inches, and a width of 32.8 inches. Like most jib cranes, it has 360 degree rotation capability. It also comes with pre-drilled holes in the base to make for easy mounting. This crane is made by vestil, an Indian manufacturing company that specializes in material handling equipment. Customers say that assembly is quick, about 30 minutes. In general, most buyers were happy with their purchase, although one warned that the chain in the product picture was not included. The Vestil WTJ-2 is a very affordable jib crane. If you are looking for a versatile winch operated jib crane, then this is the one for you. Shipping – Most of these cranes come shipped in several boxes on a pallet. It would be useful to have a pallet jack or similar item to help move it to the assembly location. Assembly – A few of the product reviewers mentioned that although the assembly for these jib cranes was not difficult, however some people were missing directions. It would be wise to have a full set of tools to put the crane together, and also look up directions beforehand. Thanks for reading our review of jib cranes. If you have any questions about the products in this list, or would like us to review an additional product, let us know.